In the 11 spot is Ghor-Clan Rampager. This beast definitely needs to be mentioned before rotation. 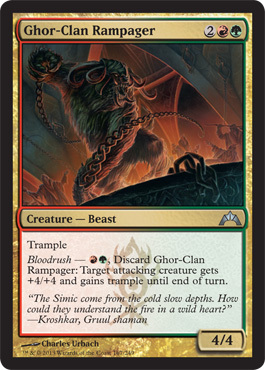 The Rampager came to the forefront of standard in Gruul Aggro alongside Hellrider and Burning-Tree Emissary. That deck was notorious for turn 4 kills thanks to Hellrider, and Ghor-Clan Rampager just made it worse. Thankfully we only had a few months with that deck before Innistrad block rotated, but during Theros Ghor-Clan Rampager found a new home in GR Monsters. He made just about any creature a threat, even Elvish Mystic. Flesh//Blood ended the game very quickly if people weren’t careful. The deck eventually moved into Jund and Naya colors, but the archetype fell out favor in the spring and never recovered. 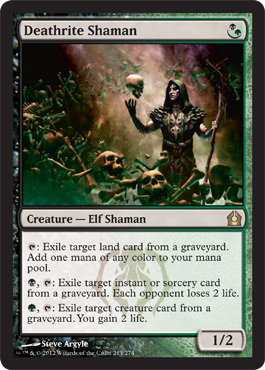 With the loss of this card and Domri Rade, we can be pretty sure that the deck won’t be resurrected after RTR rotates. I’m pretty sure I’ve seen it in a few Modern decks. They see play in some Infect decks, as well as in Zoo. Foils and Promos might be worth picking up if you can get them for cheap. Both decks could get stronger with the Khan fetchlands. Hold onto what you have if you haven’t sold them already though. The Bloodrush keyword means he probably won’t be reprinted so if he does see more play this could go up to $1-2 from it’s current bulk status. I really don’t see Rakdos Cackler seeing any play in eternal formats after rotation, but I did want to mention it before it becomes extinct in standard. This little guy is what made Mono red aggro so dangerous since he was printed. He Lets you put a 2/2 body in play for 1 mana and against slow decks he can be deadly (especially in multiples). 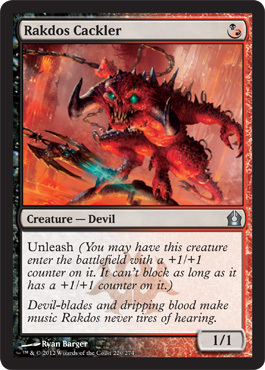 Rabble Red uses him right now, and without it the deck is definitely going to slow down in a few weeks. Dreadbore saw a lot of play on and off since it was released thanks to the Planeswalker heavy standard metagame, but it has a lot of competition in Modern and other formats. The 2 mana cost and ability to target a planeswalker or creature could lead Dreadbore to see some play in EDH, but I don’t think you’ll see it in many tier 1 decks in Modern or legacy. I don’t expect it to see that much play after rotation, but it is possible that we will see it again in a future set. There isn’t a keyword holding it back, and the name is pretty general too, so I wouldn’t put it past Wizards to reprint it in a few years for standard again. If you can trade them away for value, great. Otherwise, it might not be a bad idea to put them in a box and wait for them to see play again in the future. Obzedat was a great card in Junk reanimator decks both during ISD/RTR block and in RTR/Theros block. It’s also seen play in the last few months in BW Midrange. It’s a great card against control decks, and it worked really well with Whip of Erebos. It was up to $15 at one point, but has now dropped to $3.50 close to rotation. I expect it to drop a little bit more by October, but it should stablize around $3. I’d expect this deck to see some EDH/Commander play (meaning the foil might be a good investment), but I don’t know if its popularity in that format will lead to a higher price. Most likely we’re looking at a $3-5 price range in the long run unless it’s picked up in EDH. I’d hold what you have, but probably wouldn’t invest in any for the long run. If you could get a foil for $10, I’d do it though. Wow, do you remember when this guy was a $30 card? I do. I remember how psyched it was when I opened a Japanese foil. 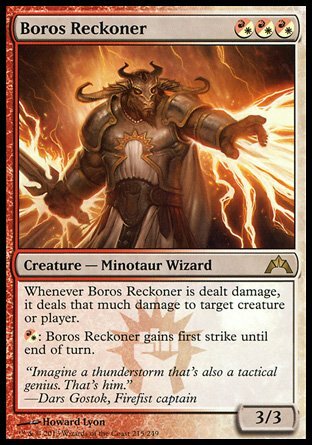 Boros Reckoner was one of those cards that sneaked in during the Gatecrash release and took the metagame by storm. It was great in the RBW Aristocrats deck alongside Blasphemous Act and Lingering Souls. That deck allowed you to flood the board with tokens and get your opponent down in life, then would cast Blasphemous Act to finish them with 13 damage (26 if you had 2 in play!). I’ve actually seen him as part of a Modern Aristocrats deck and he’s great in red devotion strategies as well, but I don’t know if those decks will take off. He should stay around the $3 range after rotation, but I would keep an eye on how red devotion and Aristocrats do in modern in the future. I don’t expect him to go up, so if you can trade him away do it. Red devotion decks in standard are definitely going to miss him, but not as much as all the other 2 drop double red cards. 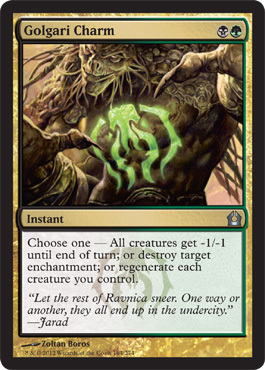 While not as common place as Boros Charm, Golgari Charm has found its way into Modern as well in GB decks. The card really broke out during Theros block standard thanks to its “destroy enchantment” mode, but the other ones have been very useful too in stopping an army of 1/1 tokens or saving your creatures from a Supreme Verdict or other board wipe. BG decks are losing a great card for their sideboards, but they should be able to make do with cards like Back to Nature. I doubt the regular price will go up in the future, but if you can get a foil one for around $5-6 it might be worth picking up. Jund and GB “The Rock” players will definitely continue to be a fan of it. Deathrite Shaman used to be a key card in GBW reanimator during Innistrad/RTR standard, and at the same time it saw a lot of play in both Legacy and Modern. It became too good for Jund/GB in modern and ended up being banned, but before it was the card saw prices of around $20. Even banned in modern, the card still demands a $9 price tag. I really only see the card going up in value more and more as more players get into Legacy. Heaven forbid they ever un-ban it in Modern, but if they do you can be sure it will double in price again. I think you should pick up a playset now while they can be had for under $40. I’m pretty confident it will double in price in a year or two. Its absence won’t be noticed in standard though. When Vraska the Unseen was first released, everybody thought she was amazing. She was $20+ at most places. Then suddenly people realized there wasn’t really a deck for her in Innistrad/RTR standard. It wasn’t until the rise of B/g devotion in Theros standard that she finally saw play. She was a good sideboard card to bring in against control player to destroy their Detention Spheres and planeswalkers. 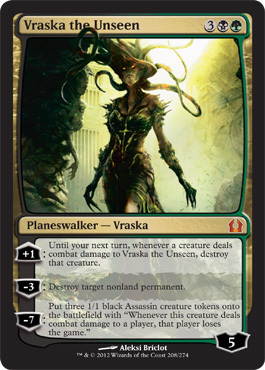 Fast forward a few months to just a few weeks ago and we can see that Vraska became a key part of the powerful Jund Planeswalkers deck as well. She had a key role as removal in that deck, and without it the deck might struggle with some permanents such as Banishing Light or other planeswalkers. I think she has a future in EDH though, so I would invest in foils if you can find them. They shouldn’t be too bad, maybe around $10. Investing in the Jace Vs. Vraska foils might also be worth it. I think those will be the most popular versions in the coming months. It’s possible we could see her again in another set in the future, but I wouldn’t expect anything for at least 2-3 years because of her double printing during the Return to Ravnica block. My guess is that she’ll be a slow gainer over the years. I don’t think she’ll break double digits, but it should be a small profit compared to her current $3.50 price tag. 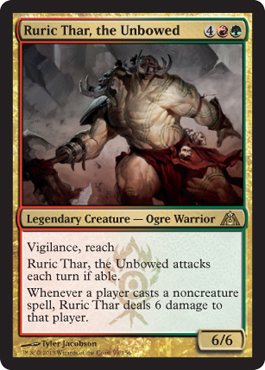 Out of all of the Guild leaders in the Return to Ravnica set, Ruric Thar, the Unbowed was always my favorite. Obzedat might have seen more play, but I absolutely loved how Ruric Thar punished players for NOT playing creatures. Dropping him on the board absolutely crippled control decks, and to a lesser extent black decks with a lot of removal. For most of his life in standard, Ruric Thar, the Unbowed was relegated to sideboards. He was in some Colossal Gruul decks as well as in GR Hail Hydra decks from the current season. His departure shouldn’t hurt standard that much at all, but I will definitely miss him! As for investing, I think he’s going to be great in Commander/EDH down the road. This means foils. You can get them for around $2 and I think that’s a steal. They are triple that in Japan right now where the EDH player base continues to grow, and I think we can realistically see him at about $8-10 in a year or two. I’m not sure about him being reprinted, but something tells me they probably won’t reprint any of the guild leaders outside of special sets in the future. If he gets popular in EDH, then he might be included in one in the future, but that’s not going to happen for a long time. 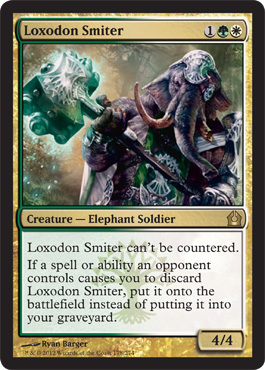 Loxodon Smiter was absolutely amazing when he was first released. UB control was huge back during Innistrad block which was heavy on counterspells like Dissipate and Mana Leak, and it also played Liliana of the Veil. Nothing was sweeter than having your opponent +1 Liliana only to put him directly into the battlefield. It’s too bad he didn’t see more play in Theros block against Thoughtseize. He was in pretty much every GW deck during ISD/RTR block and was the king of putting pressure on opponents from turn 2 (thanks to cards like Arbor Elf). At one time, his price was upwards of $7, but more and more playable green and white cards were released and he slowly saw less and less play. You can currently buy them for $1 (foil for $4-5), and I think this is a great investment. I think he’ll see a lot of play in modern in the coming months thanks to the reprinting of Wooded Foothills and Windswept Heath. Naya Zoo and GW Hatebears are both looking to benefit from these printings and Smiter is great against GB/x and UW/x control decks which make up a large amount the metagame. Thoughtseize? Take 2 damage and let me play my Smiter. Inquisition of Kozilek? Pffft, forget about it and put Loxodon into play. Plus one on Liliana of the Veil? Well, you get the picture. At $1 you aren’t really losing that much money, so if you have a few bucks to spare pick some up and sit on them in your trade binder (I’ve already bought about 10 of them). Today’s cards weren’t huge movers/shakers in the standard metagame, but their loss will overall affect it. Ghor-Clan Rampager is what made the Monsters deck work and it won’t do well without it. Rakdos Cackler was also an important one drop of Rabble Red. His departure means the deck will be just a tad bit slower than it is currently. 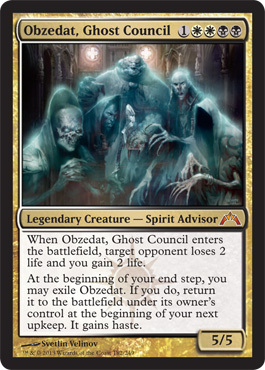 Obzedat, Ghost Council leaving means that BW midrange also suffers another casualty and that it probably won’t be around in a few weeks either. Without Boros Reckoner, red devotion decks are pretty much done, and Golgari Charm will be missed in an upcoming standard dominated by Courser of Kruphix. While doing this article, I also looked at which cards were NOT rotating and which decks seemed like they’d be the most viable after rotation. I made a small list of decks I think will do well alongside of the new Khans cards, so if you haven’t started buying cards for these decks yet you better get the move on before prices go up. Some cards have already jumped in value (Goblin Rabblemaster, Courser of Kruphix, Sylvan Caryatid), but there are still a lot that can be bought for a good deal. We have less than 2 weeks until rotation happens, so get jumping on these cards before other people do! I also wish you good luck at the pre-release (if you haven’t gone already by the time you read this). There are tons of articles still on the way from me here at The Japan Hobbyist, so be sure to stop back later this week and check them out. Thanks for reading!